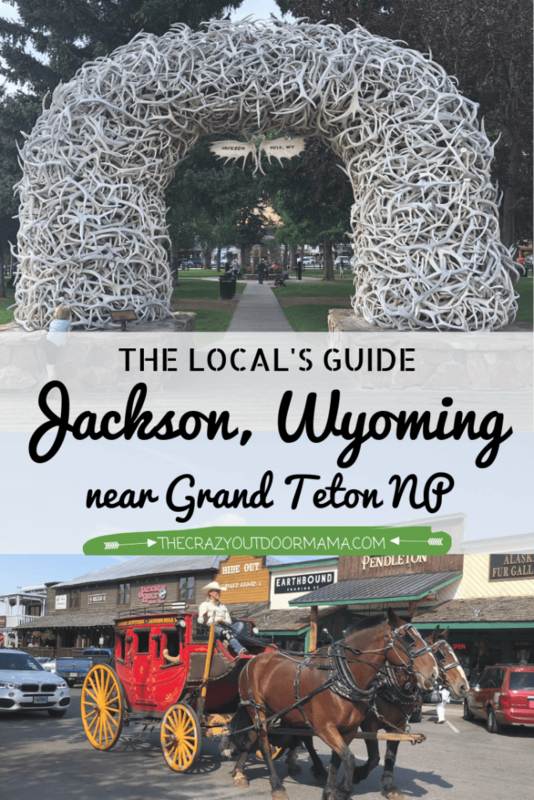 Learn the must-sees and things to do in Jackson Hole Wyoming with kids in my insider guide! 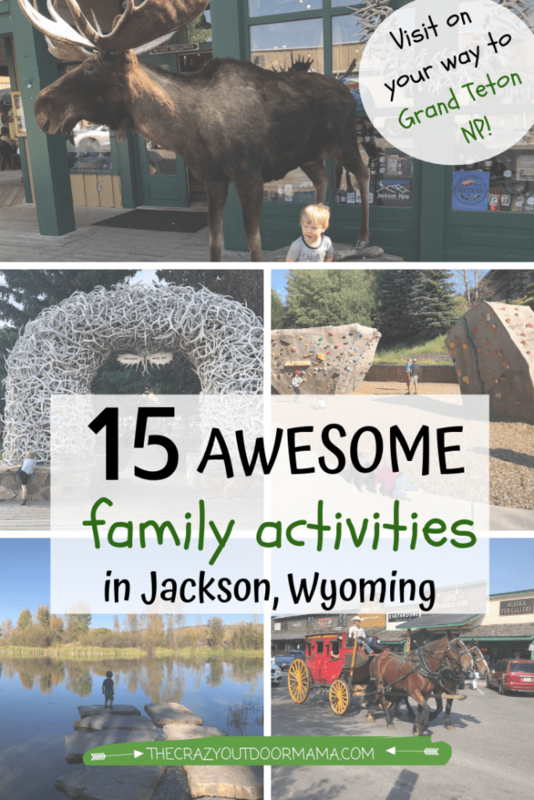 Jackson, WY is full of awesome stuff for kids to do, whether you have babies or big kids! If you’re reading this, it’s likely you know about Grand Teton National Park and Yellowstone National Park that are right by us. These are SO amazing, and it’s a whole other article to talk about all the fun stuff to do there! I wanted to focus on the town portion of our beautiful area! I love exploring the towns near national parks – normally there are tons of activities, the food is awesome, and the structure is unique! 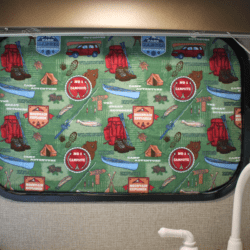 It can be especially helpful to know where to go in town if you have kids – rainy days, sickness, or just a break from hiking and sight seeing to name a couple reasons! At the time of writing this, I have three kids three and under. Before my twins were born I used to be able to take my son on a hike, or just go out and about for a whole day. Now with my twin one year olds in the mix, I’ve been sticking to town a little more since there’s no way for me to carry three kids while hiking! I wanted to note if we go to the National Parks that my three year old does hike, but it’s not very long distances (little legs!) I tend to stick around places where there is plenty of play, and hiking available if we choose to do so! 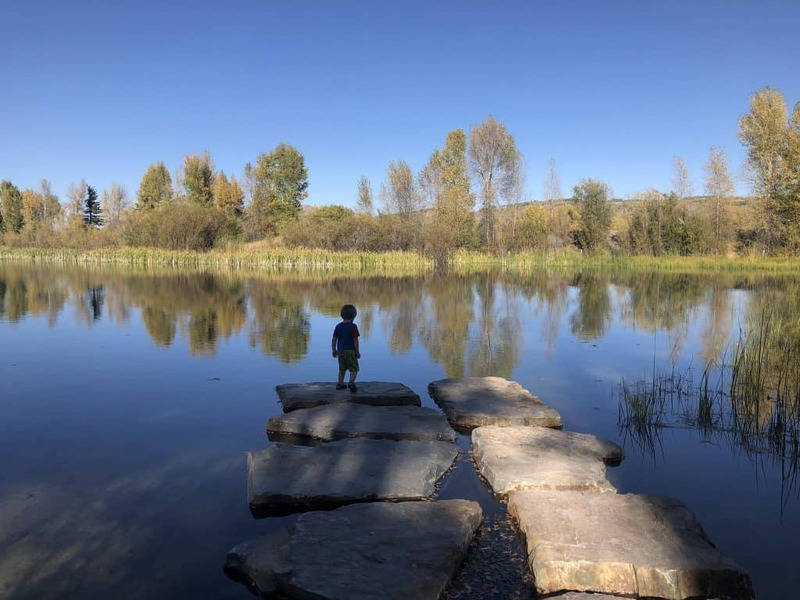 Check out these guides to String Lake and Granite Hot Springs if you want something more on that level for the littler kiddos! 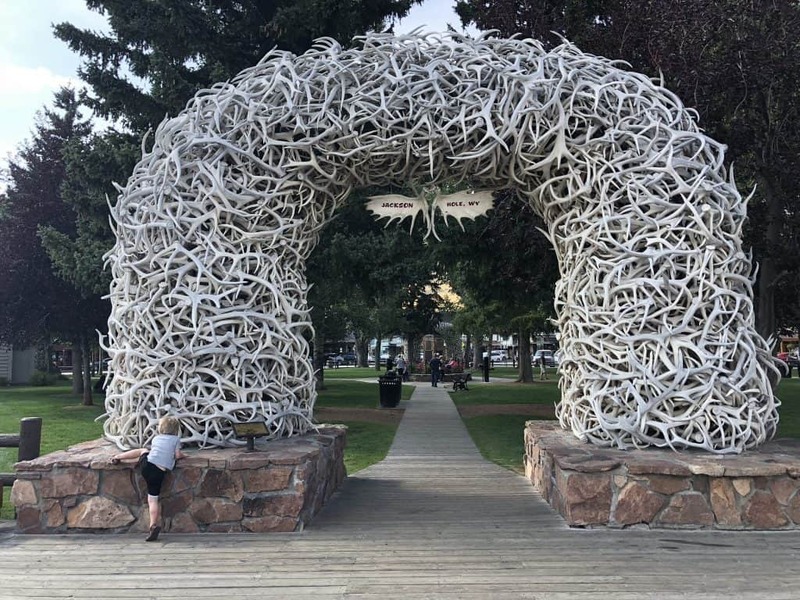 Without further ado, here’s the local’s guide to enjoying Jackson, Wyoming with kids! 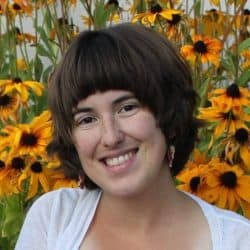 I have tried to list the activities closest to Jackson first to make planning easier – if you’re looking for less common stuff (I know everyone says to visit the Elk Antler Arches!) keep scrolling and you’ll find the real gems in Jackson! 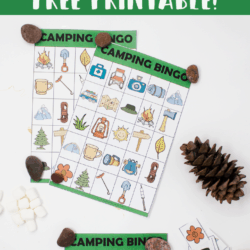 I also want to emphasize this is for families with young children – there’s alot of adult fun stuff too, but it’s too much to just “add on” to this guide! 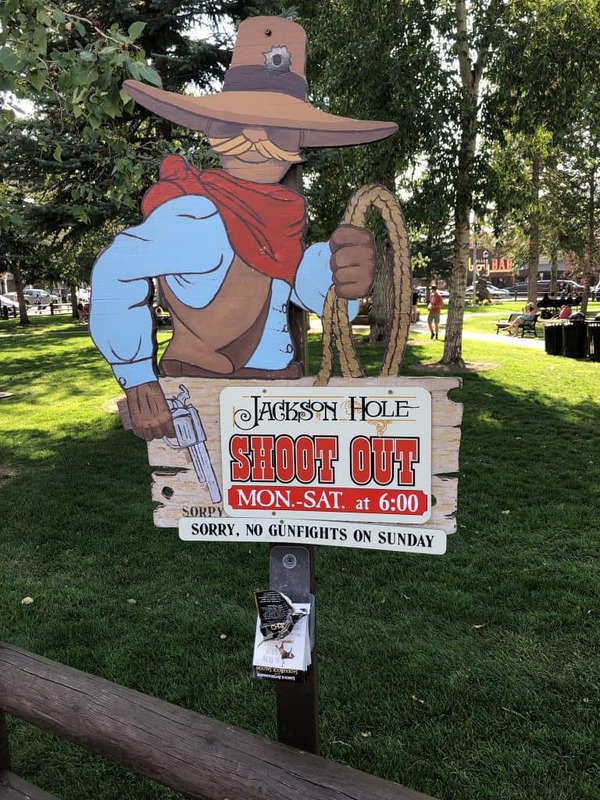 Probably the most iconic spot in Jackson (besides silhouettes of the Tetons), the town square is a great place to picnic if you’re exploring town. There are massive elk antler arches the kids (and adults!) will get a kick out of, there’s usually a musician playing music around, and the kids can watch the horse carriage rides that make their stop along side the square for drop off and pick up! There’s also a beautiful memorial in the middle of the square! Be aware that while it is a great place to picnic, there are no picnic tables (that means more room for the kids to run!) so bring a blanket if you like! Check the community calendar, or pick up a free copy of the Jackson Hole Daily to see if there are any events going on. If you’re visiting during summer, there are weekly Farmer Markets on Saturday mornings from 8-12 that have some amazing homegrown treats! My 3 year old loved touching all the antlers! The antler arches are actually made with sheds from the local elk (Sheds, meaning every year they “shed” their antlers. These weren’t killed and sawed off, don’t worry!) Every couple of years they replace them with new ones! 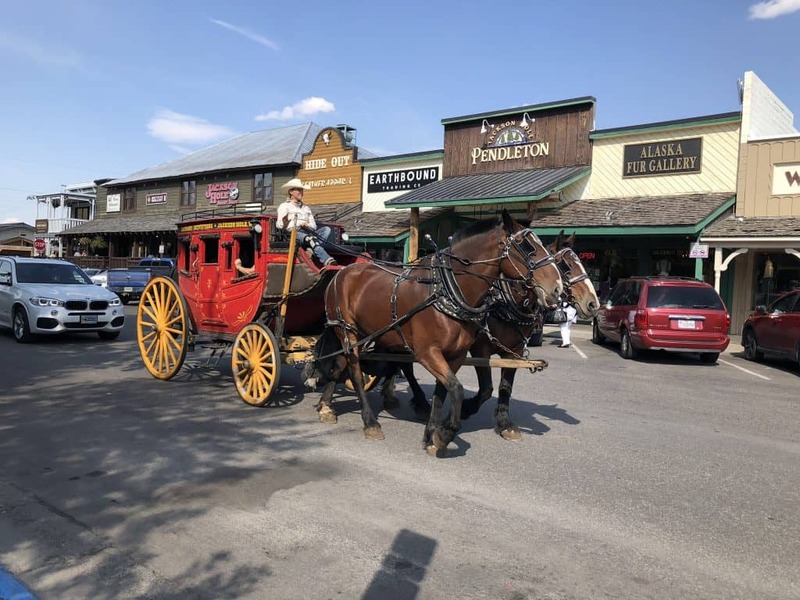 As a testament to the wild west past of Jackson, there are horse carriage rides that happen every 15-30 minutes that depart from town square! The horses are MASSIVE, and the cart looks like something from 100 years ago! Even if you don’t take a ride, it’s worth taking the kids to look at and try to snap a picture with! Their facebook page is here, and seems to have the most recent and up to date info! These are some BEAUTIFUL horses, and the carriage is adorable! This is super fun to watch, and has been going on for decades! Every night besides Sunday, some pretty awesome actors put on a wild west show! Expect some exciting pops, horses, and fun interaction! My husband is from Jackson, and he grew up watching the show – he said he loved it! And coming from a local who is over the touristy stuff, you know it’s good if he still likes it! It does get pretty busy, so you’ll want to arrive early, around 5:30 (starts at 6:00 pm) if you want to get a good spot. It’s free, but arrive early, around 5:30 and the show starts at 6:00. I never arrive early enough for the good spots, so for now I hope this cute cowboy advertisement for it suffices! Head over to the website if you want some awesome pics! 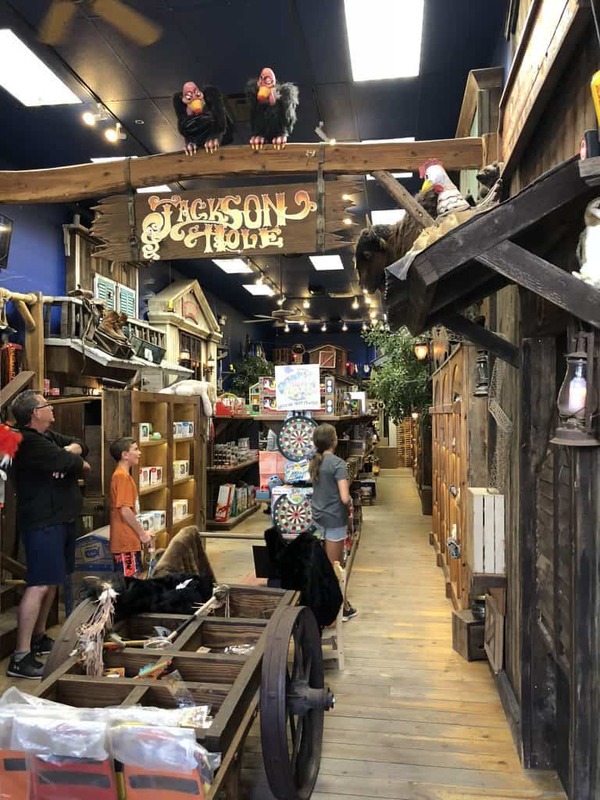 This isn’t your normal toy store… this is the home of a wild west shoot out that you can be a part of! It’s the most unique toy store you will likely ever visit – the whole store is a shooting range, and each target responds when shot! Obviously, I am not talking about real guns, but laser guns that are fun and easy to use! It’s like being in an awesome mini interactive theme park! The price to play is reasonable, and for those who are particularly good shots, there are badges and titles to be won! Don’t tell anyone I told you, but after MANY times playing this (my husband and I love to make fun bets with it, and our son loves to watch all the things move!) there are certain targets that give you bonuses! There are bonus shots that only show once things like a can or shutter move out of the way – hit those and even more bonuses come! Everything from cans shooting up, buffalo heads talking, chickens laying eggs, and more make for a REALLY fun time! Even if you’re kids are too little to shoot, they’ll get a kick out of watching all the animals and decor move! Also, besides all that, this toy store has amazing wood, STEM, and plush toys imported from around the world. It’s not your typical tourist junkey stuff, but instead quality toys that’ll actually last! The toys are very quality and unique – if you’re looking for something different than cheap touristy junk, check this place out for a toy that will last a lifetime for your kids! This picture doesn’t do it justice! Mainly because it’s hard to see all the detail that’s near the ceilings, and all the movement and interactiveness of it! This is THE SPOT for a bad weather day! The children’s museum is not necessarily a museum, but more a big collections of fun themed playrooms! There’s a gated baby area for little ones with baby toys, but it’s easy to monitor the babies while watching the big kids in the rest of the museum! 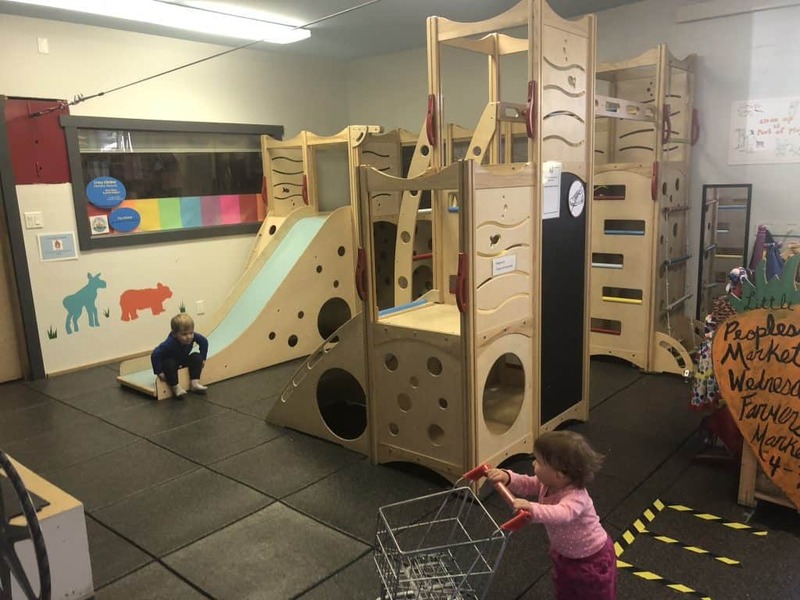 A play gym, store, airplane, craft room, and more (they change up the activities) are just some of the things to be found! If you come during summer, there’s likely some activity in their front yard. It’s gated, so it’s a great place to let the kids stretch the legs if it is a nice day. FYI, they are moving after February 2019, so I’ll try to remember to update this article once I check out the new spot! Open from 10 – 2 everyday except Tuesday, which they are open till 5. Click here if you’d like more information or directions! 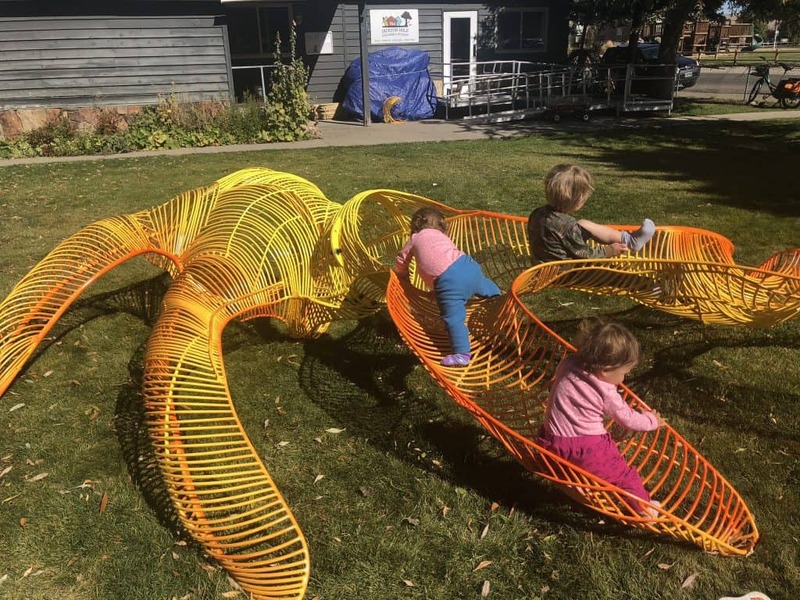 One of the cooler outdoor activites I’ve seen them have for the kids! All of them loved it, and we almost didn’t even make it inside the museum that day! A welcome sight for parents of busy bodies cooped up in hotel rooms or the like due to bad weather! This is a great indoor activity to burn off energy! 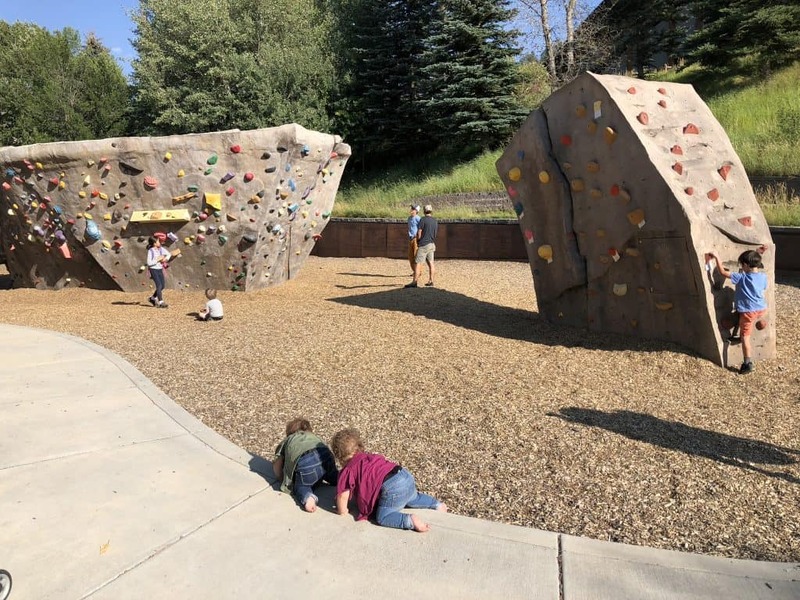 There are a couple of playgrounds in town, but the coolest one is definitely Phil Baux Park (the park right at the base of the Snow King Resort). It has some pretty awesome climbing towers that bring out even the adults! In fact, often times you’ll see small meetups, and markers on the holds documenting certain routes or accomplishments. They aren’t tall, but they are pretty difficult! Of course, there is a typical activity set for the kids to play on and swings and such. Miller Park is another park that is pretty run of the mill, but keep an eye out in the paper for special events that often occur there during summer such as REALLY amazing Art Festivals! I think this is the best place in town just due to the proximity to Snow King. While my kids aren’t quite old enough to appreciate this yet, they do like watching the other climbers, and there’s a play gym right behind me to hang out at! If you have the time and money, Snow King Resort is an amazing experience! The “locals mountain” is right in town, and hs a ropes/zip line course, roller coaster, gondola, and more! It’s a fun place to spend a day at if you love adventure! Obviously, their activities change from summer to winter, so be sure to check what’s open! Expect to spend some money! It is the nature of resort towns. With that being said, it is a really amazing experience! Snow King Resort does have a luxury hotel you can stay at, and is a great spot to be at during winter or summer! The mountain is right out your door! The People’s Market happens at the base of Snow King every Wednesday 4-7! It runs June 6th to September 18th during summer (as of 2018) and every other Saturday November through April during winter. It’s a great place for local food and drinks! Check out all the info about it at their website! If you come from a place that doesn’t have rodeos, then this is a part of the Jackson/western experience you need to include in your itinerary! Starting May 26th and ending August 31st (Wednesdays and Saturdays only), you can see some pretty awesome roping, barrel racing, bronc and bull riding! If you want to check the schedule or get some tickets, head over to their website! The Teton Raptor Center is a rehabilitation, education, and research facility for the areas raptors (birds of prey)! 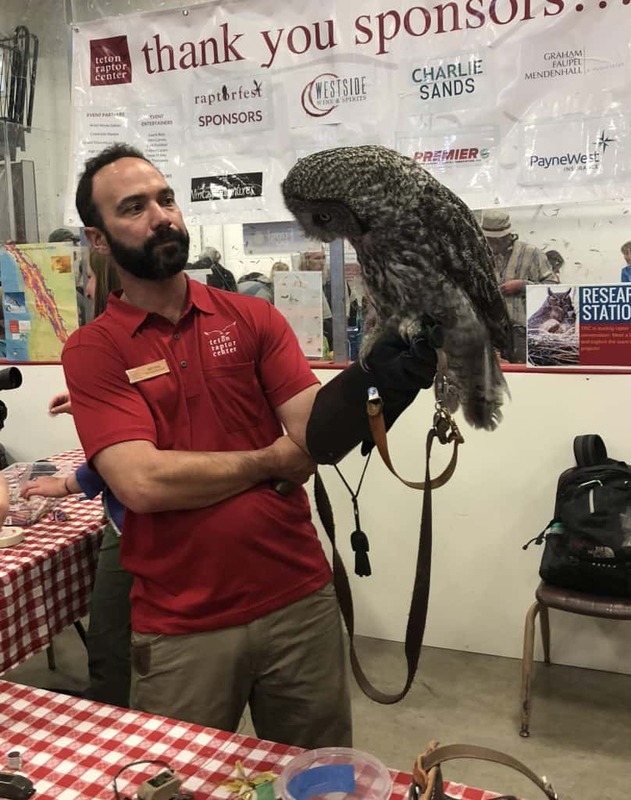 While they do come to town for some special events, the easiest way to have an amazing up close and personal session with these awesome birds is to reserve your spot ahead of time at one of their “Raptor Encounters” in Wilson (about 20-30 minutes from Jackson). Kids will love seeing these birds of prey up close, and learning all about them! They also have some pretty cute gifts!! A portion of this is outside, so bring jackets and such if it’s early or late season! Admission is $18.00 for adults, $15.00 for kids 4-12 and seniors over 65, and kids three and under are free! Find more info about the facility here! If you are visiting Jackson around Father’s Day, be on the lookout for the “Raptor Fest”. They put on a pretty cool event, with TONS of crafts and birds, right here in Jackson! It’s usually combined with the Crawfish Boil (another Father’s Day event) so it’s doubly good! This was during Raptor Fest 2018 – it’s normally an outside event, but it was pouring so the whole thing moved inside! If you are a fish geek, or just like to see big fish up close, this is a fun short stop to check out if you have time! This is where they raise cutthroat trout to help stock the rivers and lakes in the area. A volunteer will guide you on a quick 20-40 minute tour of the facility. Kids will love seeing the giant tanks filled with fingerlings, and they’ll love the stocked pond with MASSIVE trout even more! The water is usually pretty clear, and it’s pretty awesome to see them so close! Don’t be surprised if you see fisherman – you are allowed to take home one fish per license! It’s a great spot for little fisherman! The bathrooms are clean and the area is not known so it’s not very crowded. Take the opportunity to learn about the importance of the native cutthroat trout in the local ecosystem! It is located about 3 miles out of Jackson (on the way to Grand Teton National Park / Airport) so it’s a perfect stop to stretch your legs going to or from! It is open daily 8-4, except for federal holidays. See the website for more information! It’s actually located on the Elk Refuge, so expect some pretty views! If you don’t mind driving a bit (maybe 20 minutes from Jackson), you have got to check out this beautiful little park! It’s stroller friendly, and has a lake for SUPing / Kaying, as well as fun trails and giant hills for the kids to climb! It is a relatively new park, and they keep adding to it every year as donations come in, so I imagine there will be even more available to do here as time goes on! The lake does have fish in it, so bring your pole if that’s what you’re into! Check the website out here for a list of current events! This is the rock boardwalk I was talking about! It’s beautiful here at the R Park! Jackson is a VERY bike friendly town – you can get almost anywhere without ever having to be on a road or highway. Recently, a bike share program has started that has made it way easier to bike around if you don’t actually have one! You rent it from one of the many “hubs” in town, ride it around, then park it back at a hub! For the map of where these hubs are, along with other information, check the START Bike Program site out! The bike paths are especially nice in town because a lot of it goes around the “boring” parts (gas station, grocery store etc) and goes along a beautiful creek! Teton Village is a MASSIVE resort, and has some world class activities! “Big Red” is the nickname of the tram there, and will give the best view of the valley! It has a great playground for kids, a splash pad of sorts, rock climbing, and more! Grand Teton National Park is about 30 minutes from Jackson, and very worth the drive (if you weren’t already going!). There’s tons of hiking (check out my Guide to Grand Teton National Park) to be done, views to be seen, and areas to explore! If you’re looking for an easy day with little kids though, I’d recommend checking out String Lake! If you are looking for a WAY bigger challenge (but with big rewards) check out the Amphitheatre Lake Hike! Granite Hot Springs is around an hour away from Jackson, but is a unique experience you won’t regret spending the time to drive to! Check out everything you need to know here! Scenic Float or White Water Raft the Snake River – An experience definitely worth having! Check Dave Hansen Whitewater to book it! They have been in Jackson doing this for 50 years, and know their stuff!